The issues: Do boycotts work? Is buying local better? How can we reduce our impact on global warming? The products: From coffee to cars, fish to furniture, pensions to plane tickets -- the problems and the ethical options. The companies: Where to shop and what to look for in food, clothes, banks, travel agencies and much more. Packed full of information and with tips on how to do your own research, The Rough Guide to Shopping with a Conscience is the essential handbook for responsible consumers. 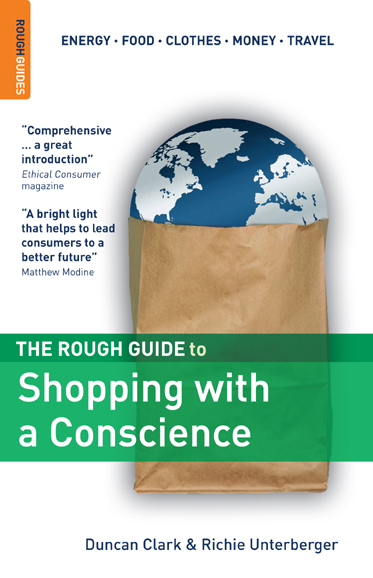 The Rough Guide to Shopping with a Conscience is widely available at both independent booksellers and chain bookstores throughout North America. To order on-line via amazon.com, click on the book cover below.